An unusual structure with a hexagonal shape surrounding Saturn’s north pole was spotted on the planet for the first time thirty years ago. Nothing similar with such a regular geometry had ever been seen on any planet in the Solar System. The Planetary Sciences Group has now been able to study and measure the phenomenon and, among other achievements, establish its rotation period. What is more, this period could be the same as that of the planet itself. Saturn is the only planet in the Solar System whose rotation time remains unknown. The research illustrates the front cover of the journal Geophysical Research Letters and has been highlighted by the publication’s editor. In 1980 and 1981 NASA’s Voyager 1 and 2 space probes passed for the first time over the planet Saturn, located 1,500 million km from the Sun. Among their numerous discoveries they observed a strange, hexagon-shaped structure in the planet’s uppermost clouds surrounding its north pole. The hexagon remained virtually static, without moving, vis-à-vis the planet’s overall rotation that was not accurately known. 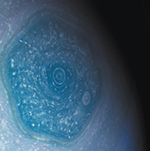 What is more, the images captured by the Voyager probes found that the clouds were moving rapidly inside the hexagon in an enclosed jet stream and were being dragged by winds travelling at over 400 km/h. Dr. David H. Levy, co-discoverer of comet Shoemaker-Levy 9, is one of the most acclaimed amateur astronomers of our time. He is the discoverer or co-discoverer of twenty two comets and more than 150 asteroids, and is the first person to have discovered comets visually, photographically, and electronically. Dr. Levy is a well-known popularizer of astronomy, who has spent a lifetime advancing the active engagement of others in the rich cultural pursuit of astronomy by personal example and through live appearances, and print and electronic media. The conviction that astronomical observation, both recreational and scientific, provides a way to discover more about our place in the universe and to better know ourselves is shared by Dr. Levy and the Royal Astronomical Society of Canada (RASC), an organization of which he has been a member for nearly as long as he has been an astronomer.